Spring and warmer weather is still far away but that doesn't mean your footwear can't still be chic and affordable. We've shown you several stylish boots that are still very fashionable so why stop - here's another drool-worthy bootie to add to your wardrobe this season. 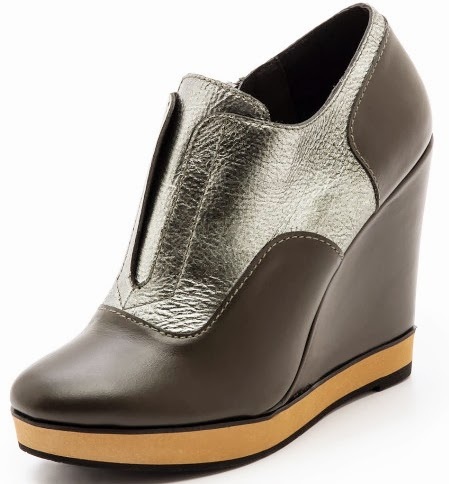 Say hello to the Nanette Lepore Two Timer Wedge Bootie, an Oxford-inspired wedge bootie that boasts a futuristic feel with metallic leather accented vamp, calfskin leather upper, faux front closure, contrast color foam rubber sole, exposed side zipper closure and a 4" wedge heel with 3/4" platform. Luckily for you, this baby is currently on sale on Shopbop for $189.00. Happy shopping.